Being in a picturesque country location you are guaranteed your wedding day at Manor House in Midrand will be a very special occasion. The entire day will be dedicated to the “happy couple”, making sure that your special day is full of wonderful memories. To pamper the bride we will only hold one wedding at a time. Our team of professional staff will ensure that your day will run smoothly leaving you to relax and enjoy yourselves. We offer a personalized service taking care of all the details for you. Our “Camelot” Room seats up to 130 guests, giving you room for a dance floor that your guests can enjoy watching the first romantic dance. A buffet of your choice designed around your budget will be prepared in our own kitchens. For the smaller wedding with an appeal of intimacy, may we suggest our private restaurant that seats up to 48 guests. We will personally tailor all wedding requirements to suit individual needs, and of course your budget. 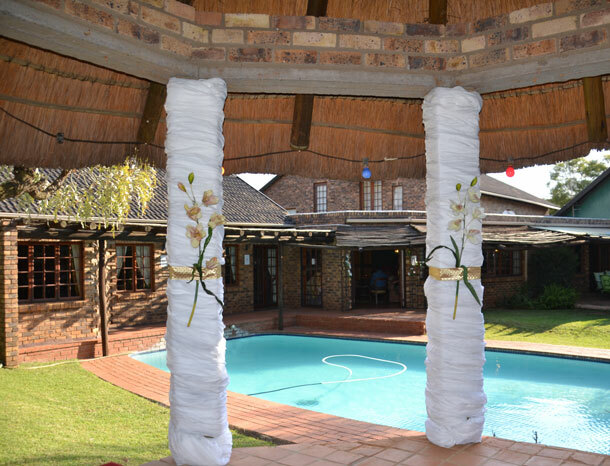 To book your wedding at this venue telephone Helen, Sam and the team on +27 (0)11 238-7021. Alternatively visit Manor House for further details or to send an enquiry.